After you’ve visited the most important sites in the Eternal City, on this very special tour you’ll discover the Hidden Treasures of Rome that are usually never seen by ordinary visitors. Move beyond the Colosseum and Vatican tours to scratch below the surface of Rome’s history. Italy’s Best will provide a private tour in Rome tailored to your needs, allowing you to focus on a selection of Rome’s churches, archeological monuments, and unforgettable panoramas. 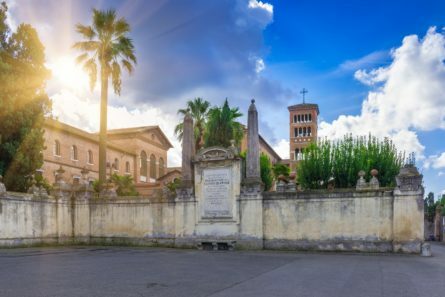 Your private guide in Rome will take you to discover such delights as the Basilica of Santi Quattro Coronati. With its beautifully preserved frescoes and quiet setting, the church transports us back in time. A jaunt to the Appian Gate and a trip down the famous Appian Way allows us to unfold the mysteries of Ancient Rome and both the daily life and funerary habits of wealthy ancient Romans. The enormous Baths of Caracalla, home to summer opera performances, inspires with its size and exemplifies social life in Ancient Rome. Your guide then moves to the Aventine Hill‘s ancient monasteries and churches, and even the awe-inspiring Monte dei Cocci in Testaccio. An ancient Roman “trash heap” made of thousands of ancient terracotta vases, this special site highlights the unique characteristics of Roman society. You’ll finish your extraordinary journey with a spectacular view of the Eternal City from the top of the Janiculum, one of Rome’s highest hills. From here take pleasure in the Fontanone (literally “Big Fountain”), created in the early 17th century by Pope Paul V to mark the end of the Acqua Paolo aqueduct. The trickling waters sooth as you look out toward the whole of the city, taking in one of Rome’s most spectacular views. From here, your guide will point out the best of Rome’s architecture along the skyline and leave you plenty of opportunities for the perfect photo moment.